corresponds to different modes of environmental justice in world politics. Achterberg, Wouter. “Environmental Justice and Global Democracy,” In Governing the Environment: Global Problems, Ethics and Democracy, edited by Brendan Gleeson and Nicholas Low, 183-195. Palgrave Macmillan, 2001. Mexico Border,” Race, Gender, and Class Vol. 5.1(1997): 80-103. Basel Action Network. “The Basel Ban – A Triumph for Global Environmental Justice,” Briefing Paper No. 1 (May 2003). Beierle, Thomas C. and Jerry Cayford. Public Participation in Environmental Decisions: Lessons from the Case Study Record. Washington, D.C.: Resources for the Future, 2002. Beitz, Charles R. “International Liberalism and Distributive Justice: A Survey of Recent Thought,” World Politics Vol. 51.2(1999): 269-296. Bosselmann, Klaus. “Human Rights and the Environment: Redefining Fundamental Principles?” In Governing the Environment: Global Problems, Ethics and Democracy, edited by Brendan Gleeson and Nicholas Low, 118-34. Palgrave Macmillan, 2001. Caney, Simon. “Cosmopolitan Justice and Cultural Diversity,” Global Society 14.4(2000): 525- 51. Clapp, Jennifer. “Africa, NGO, and the International Toxic Waste Trade,” Journal of Environment & Development 3.2(1994): 17-46. Conca, Ken. “Rethinking the Ecology-Sovereignty Debate,” Millennium 23.3 (1994): 701-11. Conklin, Beth A. and Laura R. Graham. “The Shifting Middle Ground: Amazonian Indians and Eco-Politics,” American Anthropologist 97.4 (1995): 695-710. Davies, Peter. “Public Participation, the Aarhus Convention, and the European Community.” In Human Rights in Natural Resource Development: Public Participation in the Sustainable Development of Mining and Energy Resources, edited by Donald N. Zillman et. al., 155-185. New York: Oxford University Press, 2002. Dejeant-Pons, Maguelonne and Marc Pallemaerts. Human Rights and the Environment. Strasbourg: Council of Europe Publishing, 2002. Dryzek, John. The Politics of the Earth: Environmental Discourses. New York: Oxford University Press, 1997. Faber, Daniel. “Building a Transnational Environmental Justice Movement: Obstacles and Opportunities in the Age of Globalization.” In Coalitions Across Borders: Negotiating Difference and Unity in Transnational Struggles Against Neoliberalism, edited by Joe Bandy & Jackie Smith. Lanham, MD: Rowman and Littlefield, 2003. Grubb, Michael. “Seeking Fair Weather: Ethics and the International Debate on Climate Change,” International Affairs 71.3(1995): 463-96. Halvorssen, Anita Margrethe. Equality Among Unequals in International Environmental Law: Differential Treatment for Developing Countries. Boulder: Westview Press, 1999. Harris, Paul G. “Defining International Distributive justice: Environmental Considerations,” International Relations, Vol. 15.2(2000): 51-66. _____. International Equity and Global Environmental Politics: Power and Principles in U.S. Foreign Policy. Burlington: Ashgate, 2001. Held, David. 1998. “Democracy and Globalization.” In Re-Imagining Political Community: Studies in Cosmopolitan Democracy, edited by Daniele Archibugi et al., 11-27. Stanford, CA: Stanford University Press, 1998. Hempel, Lamont C. Environmental Governance: The Global Challenge. Washington, D.C.: Island Press, 1996. Hornborg, Alf. “Towards an Ecological Theory of Unequal Exchange: Articulating World System Theory and Ecological Economics,” Ecological Economics 25 (1998): 127-136. Jamieson, Dale. 1994. “Global Environmental Justice.” In Philosophy and the Natural Environment, edited by Robin Attfield and Andrew Belsey, 199-210. New York: Cambridge University Press. Keck, Margaret E. and Kathryn Sikkink. Activists Beyond Borders: Advocacy Networks and International Politics. Ithaca: Cornell University Press, 1998. Keohane, Robert O. and Joseph S. Nye, Jr. “Governance in a globalizing world.” In Power and Governance in a Partially Globalized World, edited by Robert O. Keohane, and Joseph S. Nye, Jr.193-218. New York: Routledge, 2002. _____. “Transnational Relations and World Politics: An Introduction,” International Organization 25.3 (1971): 329-349. _____., ed. Transnational Relations and World Politics. Cambridge: Harvard University Press, 1972. Kolbasov, Oleg. “International Environmental Justice: Concept and Role,” Environmental Policy & Law 27.4 (1997): 284-287. Li, Quan and Rafael Reuveny. “Economic Globalization and Democracy: An Empirical Analysis,” British Journal of Political Science 33 (2003): 29-54. Litfin, Karen T. “Sovereignty in World Ecopolitics,” Mershon International Studies Review 41.2 (1997): 167-204. Low, Nicholas and Brendan Gleeson. Justice, Society and Nature. New York: Routledge, 1998. Martinez-Alier, Joan. The Environmentalism of the Poor: A Study of Ecological Conflicts and Valuation. Northampton, MA: Edward Elgar, 2002. Miller, Marian A.L. The Third World in Global Environmental Politics. Boulder: Lynne Rienner, 1995. Paterson, Matthew. “International Justice and Global Warming.” In The Ethical Dimensions of Global Change, edited by Barry Holden, 181-201. New York: St. Martin’s Press, 1996. Paterson, Matthew, David Humphreys and Lloyd Pettiford. “Conceptualizing Global Environmental Governance: From Interstate Regimes to Counter-Hegemonic Struggles,” Global Environmental Politics Vol. 2.2(2003): 1-10. Patomäki, Heikki. “The Tobin Tax: A New Phase in the Politics of Globalization?” Theory, Culture and Society Vol. 17.4(2000): 77-91. Payne, Rodger A. “The Limits and Promise of Environmental Conflict Prevention: The Case of the GEF,” Journal of Peace Research 35.3(1998): 363-380. Porter, Gareth and Janet W. Brown. Global Environmental Politics. Boulder: Westview Press, 1991. Rich, Bruce. Mortgaging the Earth: The World Bank Environmental Impoverishment and the Crisis of Development. Boston: Beacon Press, 1994. Rosenau, James & Ernst-Otto Czempiel. Ed. Governance without Government: Order and Change in World Politics. Cambridge: Cambridge University Press, 1992. Sachs, Aaaron. Eco-Justice: Linking Human Rights and the Environment. Worldwatch Paper 127, 1995. Shapiro, Ian and Brilmayer, Lea. ed. Global Justice. New York: New York University Press, 1999. Shiva, Vandana. 1999. “Ecological Balance in an Era of Globalization.” In Global Ethics and Environment, edited by Nicholas Low, 47-69. Routledge. London. _____. Basic Rights: Subsistence, Affluence and U.S. Foreign Policy. 2nd Edition. Princeton, NJ: Princeton University Press, 1996. _____. “Global Environment and international Inequality,” International Affairs 75.3 (1999): 531-45. Smith, W.H. “Justice: National, International or Global?” In Moral Claims in World Affairs, edited by Ralph Pettman, 92-114. New York: St. Martin’s Press, 1979. Streck, Charlotte. “The Global Environmental Facility – a Role Model for International Governance,” Global Environmental Politics Vol. 1.2(2001): 71-94. Tolba, Mostafa K. Global Environmental Justice. Nairobi, Kenya: UNEP, 1989. Walzer, Michael. Thick and Thin: Moral Argument at Home and Abroad. Notre Dame: University of Notre Dame Press, 1994. Wapner, Paul. “Politics Beyond the State: Environmental Activism and World Civic Politics,” World Politics 47 (April 1995): 311-340. _____. “World Summit on Sustainable Development: Toward a Post-Jo’Burg Environmentalism,” Global Environmental Politics 3.1(2003): 1-10. Yokota, Yozo. “International Justice and the Global Environment,” Journal of International Affairs 52.2 (1999): 583-598. Young, Oran. “Environmental Ethics in International Society.” In Ethics and International Affairs: Extent and Limits, edited by Jean-Marc Coicaud & Daniel Warner, 161-193. New York: United Nations University Press, 2001. Zerner, Charles, ed. People, Plants & Justice: The Politics of Nature Conservation. New York: Columbia University Press, 2000. Zillman, Donald N., Alastair R. Lucas and George R. Pring, ed. Human Rights in Natural Resource Development: Public Participation in the Sustainable Development of Mining and Energy Resources. New York: Oxford University Press, 2002. ISNAD Orhan, Özgüç . "Environmental Justice in World Politics". 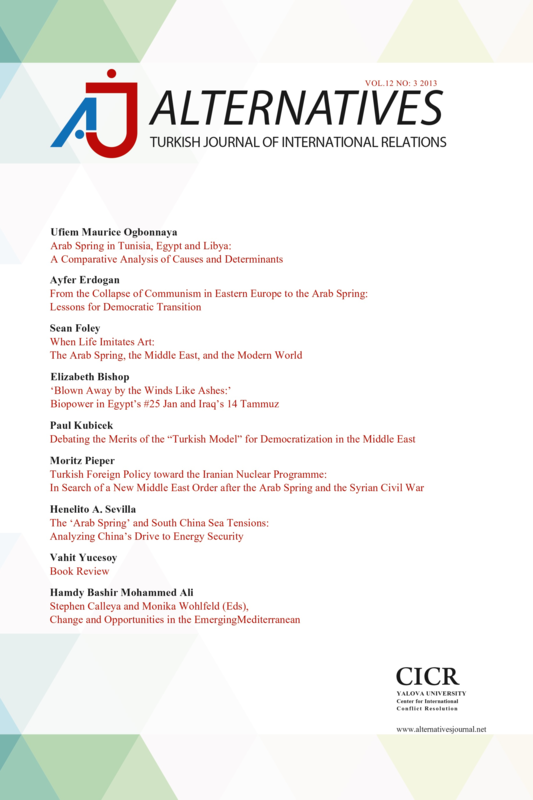 Alternatives: Turkish Journal of International Relations 8 / 1 (February 2009): 59-84.